I purchased this beautiful dance card while living in Russia and thus didn't get to see its full splendor until I arrived home. It doesn't add a whole lot to my overall knowledge of late-nineteenth-century American dance, but every little tidbit helps, and the outside art is just gorgeous -- click the image at left to enlarge it for a closer look! First, the music was provided by Steinkuehlers [sic] Orchestra. In the St. Louis publication Kunkel's Music Review, Volume 15, No. 1, 1892, William Steinkuehler advertises himself as a violin teacher and the leader of Steinkuehler's Orchestra. His "card" may be seen about halfway down the left-hand column on page 11 of the January, 1892, issue, here. Second, there was a Henrietta Club actively holding balls at a Pickwick Hall in St. Louis in the early 1890s, as chronicled by the St. Louis Post-Dispatch: "The Henrietta Club will give an elegant hop at Pickwick Hall in October..." (Thursday, September 24, 1891, p. 3), "The Henrietta Club have a handsome Invitation out for one of their elegant dancing parties to be given at the Pickwick Thursday evening, Nov. 19..." (Sunday, November 1, 1891, p. 10), etc. The outer card is made of lightweight cardstock, gently pinked around the edges, and there is a separate paper insert with the dance program. This would have let them reuse the outer card for other events. The cord and dance pencil are still attached. The card was lightly used; two names are filled in on the dance program, which may be seen at left (click to enlarge). Either the owner was unpopular or they just didn't use the card much at the ball. The back cover of the insert has the names of the committee, including "reception", "floor", and "music". I have not further researched the St. Louis Henrietta Club to find out more about it or who these people were. I would call this a very standard dance program for this time period and area of the country. The couple dances are waltz (three, plus "Home Sweet Home"), redowa (one), Yorke (two), polka (two), and schottische (two). They alternate with a variety of quadrilles: the Saratoga Lanciers (three times! 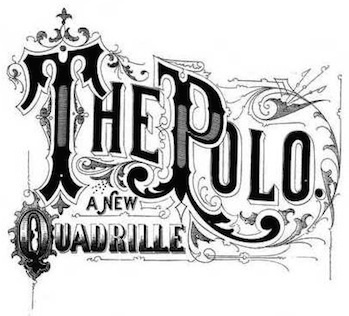 ); the Waltz Lanciers (twice); the Parisienne (twice); the Quadrille Tucker (a mixer); and two unspecified quadrilles, one of which was misprinted as "Quardrille". There is also a Virginia Reel near the end. The first waltz is labeled "Henrietta", which could indicate a piece of music, perhaps composed for the local club, or possibly a sequence dance. 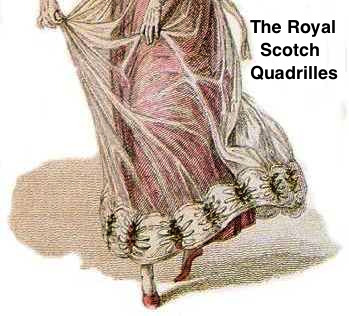 The unspecified quadrilles could be the First Set or called quadrilles. The Saratoga Lancers was a well-known and popular variation on the Lancers. The Waltz Lancers involved alternating standard Lancers figures with waltz. It appears in a number of dance manuals, so it's nice to see it on an actual card. "Old Dan Tucker" was a mixer dance with couples in quadrille formation or in a circle around the room and one or more extra dancers (usually gentlemen) in the center who would try to "steal" a partner during figures such as a grand right and left. Calling it "Quadrille Tucker" suggests the version with four couples and one extra gentleman in the center, but the circle version was noted by researcher Elizabeth Burchenal in 1918 as being popular in the Midwest. The Parisienne is the name of a late nineteenth century French sequence dance, but in this context, it most likely refers to a "varieties" quadrille (not the well-known Parisian Varieties, however!) 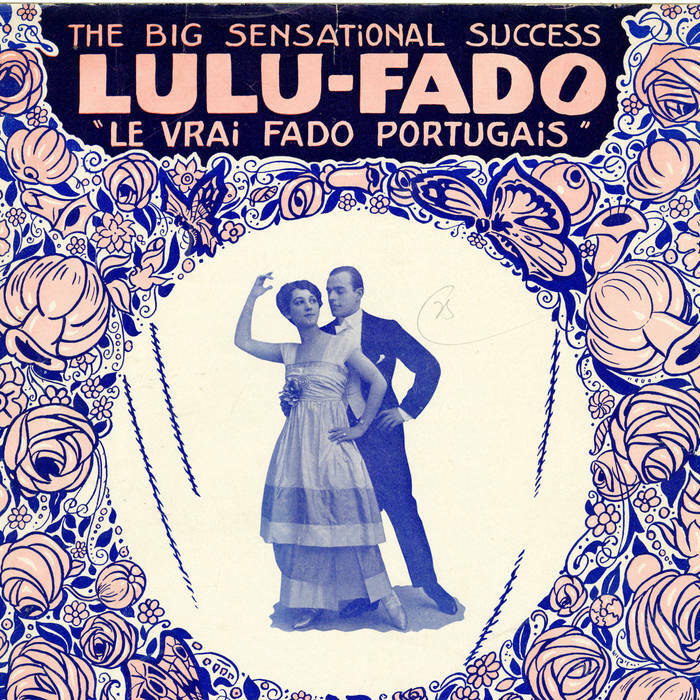 with polka and waltz sections in addition to the quadrille figures. I have several sources for the Parisienne but have never worked on a reconstruction, since the mix of figures and couple dancing requires specific music which I don't happen to have. The calls for it may be seen in, e.g., F. Leslie Clendenen's Fashionable quadrille call book and guide to etiquette (c1895 edition), the 1899 edition of the same, Professor Jay's A. B. C. Guide to Ball Room Dancing (c1900), and A. C. Wirth's Modern Quadrille Call Book and Dancing Master (1902 and 1903 editions). The Clendenen editions were published in St. Louis; the Wirth editions and Jay were published in Chicago. Midwestern dance manuals of this era often drew on English manuals, but I haven't come across a Parisienne in a quick glance through English sources. Images of the front and back covers, with the pencil, and the front and back of the program insert are below; click to enlarge.